Residents opposed to the redevelopment of Casement Park have called on the Environment Minister Mark H Durkan to hold a public inquiry into the proposed new stadium. 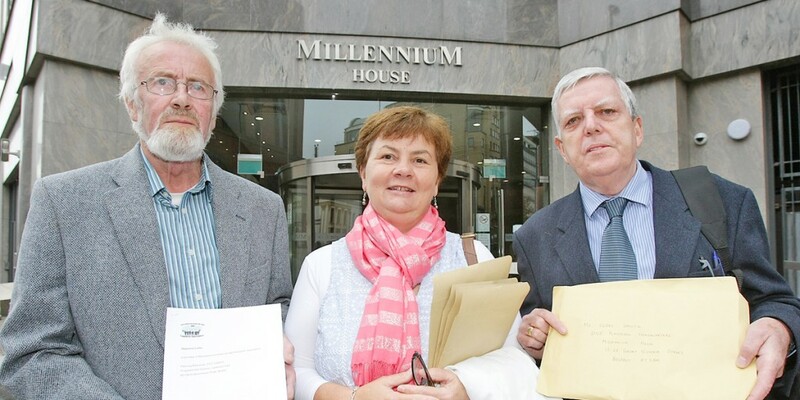 This morning the Moreland Owenvarragh Residents’ Association (MORA) will present their demand for an inquiry and their detailed objections to the Casement proposal to the Department of Environment’s Planning Service headquarters in Belfast. MORA have strongly opposed the £76.4 million rebuilding of Casement Park on the grounds that the proposed new stadium is too close to homes surrounding the stadium, that the new stands are too high and that the new stadium will have a negative visual and environmental impact on the Andersonstown area. Residents are also concerned about the frequency of big matches and concerts and associated traffic problems, and also what they see as a lack of transparency on the part of the GAA. “We have met with the Minister and have done all we humanly can to persuade the GAA that they are making a huge mistake,” said MORA spokesperson John Crossey. “We have formulated our response to the application and will hand it in this morning to the Planning Office and to date over 400 individual residents have also formally objecting to this ill-conceived proposal. We are also calling on the new Environment Minister to subject the entire proposal to open public debate and scrutiny. “All of this confusion must be brought to an end and the full facts exposed through a fully open and transparent public inquiry. The headlong rush to build this monstrosity must be brought to an end. But Ulster GAA angrily hit back, pouring scorn on MORA’s claim that the stadium will host 50,000 people. “The planning application clearly states that the total capacity for the stadium for any event is 38,000 and it won’t be any higher,” Ulster GAA said in a statement. “We are very disappointed that once again, despite repeated clarification on this matter, MORA have continued to deliberately put misinformation into the public domain on the capacity issue by suggesting that the new stadium will accommodate 50,000 people. This is totally inaccurate and false and once again we state that the maximum capacity for any for game or event in the new stadium will not exceed 38,000. The statement also revealed that MORA had withdrawn from negotiations with Ulster GAA. “Ulster GAA has been in discussions with the Mooreland Owenvarragh Residents Group since April 2012,” it reads. “We entered a process of consultation on an open and honest basis which involved significant and ongoing contact with the residents’ group and other key stakeholders. Ulster GAA have listened and used the residents’ and other stakeholders’ feedback in the development process. A planning application for the new stadium was lodged with the Planning Service by the GAA in July, allowing members of the public to register their support for or opposition to the plans. To date, 371 letters of objection have been sent to the Planning Service and only two letters of support. A decision is due before the end of the year. Ulster GAA reiterated its commitment to the project, despite the increasing volume of local opposition.